Supporters of deposed President Mohamed Morsi of Egypt demonstrating in Rabaa Al Adaeia Square, Cairo. The United Nations human rights chief today appealed to all parties in Egypt to act with restraint and initiate talks, following a day of bloody violence that left hundreds dead and many more injured. “I deplore the loss of life and call on all in Egypt to seek a way out of the violence. I urge the Egyptian authorities and security forces to act with the utmost restraint,” said Navi Pillay, the UN High Commissioner for Human Rights. 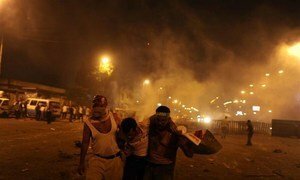 Yesterday, security forces clashed with demonstrators demanding the reinstatement of deposed President Mohamed Morsy. Ms. Pillay noted that there were conflicting reports about the scale of the violence as Government officials said more than 500 had been killed while the Muslim Brotherhood put the figure at more than 2,000. Ms. Pillay reminded Egyptian authorities that their security forces are bound by the rule of law and must act with full respect for human rights, including the rights to free speech and peaceful assembly. She also stressed that Government opponents who have reportedly attacked public buildings and religious sites should be brought to justice, and underlined that demonstrators must ensure their gatherings remain peaceful. “Wednesday’s tragic events highlight the degree to which Egypt is becoming dangerously polarized,” Ms. Pillay said, pointing to reports of violent incidents in several parts of the country in response to the clearing of sit-ins in Cairo. Reacting to Wednesday’s announcement by Egyptian authorities of a month-long national state of emergency, Ms. Pillay said it should be implemented in conformity with Egypt’s obligations under international law, ensuring that human rights are respected and protected. Ms. Pillay added that under the International Covenant on Civil and Political Rights, to which Egypt is a party, no one shall be arbitrarily deprived of his or her life or be subject to torture or other cruel, inhuman or degrading treatment or punishment, even in times of emergency. “Everyone deprived of their liberty must be treated humanely and afforded all the judicial guarantees under international law,” she said. Egypt has been undergoing a democratic transition following the toppling of President Hosni Mubarak two years ago in the wake of mass protests. Last month, renewed protests – in which dozens of people were killed and wounded – led to the Egyptian military deposing Mr. Morsy. The Constitution was then suspended and an interim government set up. The UN Special Adviser on the Prevention of Genocide, Adama Dieng, and the UN Special Adviser on the Responsibility to Protect, Jennifer Welsh, issued a joint statement expressing their serious concern over yesterday’s events. In particular, they noted with alarm the attacks against a number of Christian churches and institutions in the provinces of Assiut, Fayoum, Minya and Sohag, reportedly in retaliation to the incidents in Cairo. “We urge all Egyptians to act responsibly during these difficult moments and refrain from using violence to express their grievances, in particular by targeting religious minorities and institutions, or by using language and inciting behaviours that may escalate tensions,” they said. They noted that Christian communities have been the subject of violence in the past, and warned that violence against them could increase in the future if no measures are taken to ensure their protection. The Special Advisers also echoed Ms. Pillay’s call on Egyptian authorities to conduct investigations into the clashes in Cairo and the attacks on religious minorities, and to prosecute all those responsible for perpetrating violence. “Egypt is at a critical juncture. In order to prevent any further escalation of violence, it is paramount to ensure the respect for human rights and equal protection of all persons, regardless of their political and religious affiliation,” they added. Meanwhile, the Security Council met in a closed-door meeting on Egypt, during which it was briefed by Deputy Secretary-General Jan Eliasson. “The members, first of all, expressed their sympathy to the victims and regretted the loss of lives,” Ambassador Maria Cristina Perceval of Argentina, which holds the Council’s rotating presidency for August, told reporters afterwards. “The view of Council members is that it is important to end violence in Egypt, that the parties exercise maximum restraint, and there was a common desire on the need to stop violence and advance national reconciliation,” she added. Secretary-General Ban Ki-moon condemned in the strongest terms the violence that occurred today in Cairo when Egyptian security services used force to clear sit-ins and demonstrations, and urged all Egyptians to focus on promoting inclusive reconciliation.